The best way to cool down in Sydney’s heat is with a nice cool pool and a long, curvy water slide of course! We’ve searched Sydney to find the best water slides ever…Woo Hoo! Wet ‘n’ Wild is Sydney’s best water park and it’s an easy drive (just 40mins from the centre of Sydney). Aside from its impressive collection of massive slides, it also has 10 kid-friendly water slides including miniature versions of the larger slides like T5 and the H2GO Racers. Nickelodeon Beach is a wonderful play area for under 5s, with water slides perfect for mini-adventurers. There is also a splash play area, a huge beach and a massive wave pool. New in 2016 is the super cool Tap’N’Play wrist band ride reserver feature, and what’s sure to be a thrill-seekers favourite- The Bombora. There is also the brand new Dinosaur Lagoon which will take you back 65 million years in time and bring your face to face with 9 intercative fierce carnivores and humungous herbivores, as well as more shade via gaint umbrellas, and a new cafe. 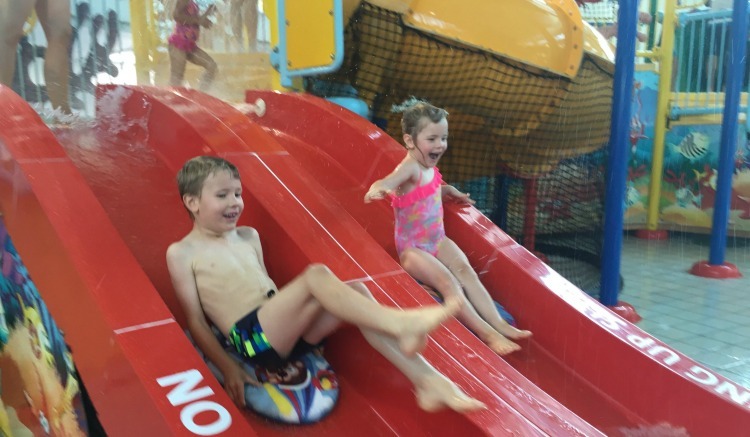 6 Ways To Get The Best Experience At Wet‘n’Wild Sydney With Kids Under 5! Sydney Olympic Aquatic Centre is the best indoor pool for families. They have a lovely water playground for toddlers and of course an excellent water slide. Kids have to be taller than 1.2 meters to slide but there are heaps of amazing waterplay for little ones. They’ll love the river rapid ride, spray jets, spurting volcanos and bubble beach. Plus there’s Splasher’s Water Playground, where there’s a gigantic bucket that fills with water and splashes into the pool below, and Aqua Tune, a playful musical instrument that kids of all ages can interact with and play to create their own musical fun! More Info, visit their website. Jamberoo Action Park is just over an hour’s drive south of Sydney. It boasts heaps of water rides including Billabong Beach, Outback Bay, and Mushroom Pool dedicated to your little swimmer! There are several mini-water slides for every kids’ thrill seeking needs and an awesome aquatic cubby house. To book tickets go here. 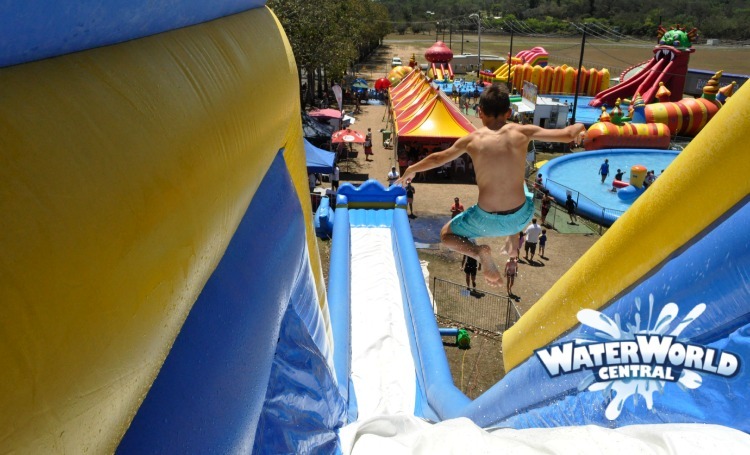 Sydney’s best pop-up water park is returning to 2 locations this summer! There’s epic water slides at the dragon pool, snow world, shark slide & hippo slide as well as fun inflatable obstacle courses and plenty to bounce on while staying cool. Parents can even join kids on the Dino Slide! More information here. To book an unlimited rider wristband go here. A brand new water park has opened, a $7.5 million investment from Fairfield Council. There are grassed areas with complementary inflatable rides, cabanas available for hire, 10m high giant slides, an interactive baby pool and a Stingray Surfing and skim boarding half pipe ride coming in 2017. It’s super cheap too- local residents can get in for just $14 each or get a family pass for only $45- cheaper than a day at the movies! Watch out for selected twilight evenings where you can enjoy the park in the evenings. Every kid will love going here! They may only have one slide but it’s an impressive 56m long! There is no restriction and no extra charge, and once they’re tired of that there’s the wading pool, bubble whirl pool, and the Rapid River. Check out the centre’s Kidzone, the fun kids area that boasts a 10 meter slide and aerated beach geysers. Be sure to splash around near the enormous Spray Bollards, or just relax near the steps with your little one. Botany Aquatic Centre has two water slides, one of which is a double tubed slide. These long, twisty slides are packed with hours of fun but kids have to be at least 1.3 metres to ride. You need to pay entry into the centre and extra for the slides. There’s an indoor and an outdoor slide for kids at Hurstville Aquatic Centre. Kids under 5 get in for free too! All children under 15 years of age must be supervised by a parent/guardian at all times. The ROC (ridiculous obstacle challenge) 5km event is coming back in February 2017 to Sydney Olympic Park! Among the 12 piece epic obstacle set that includes the infamous wrecking balls, the brand new Leap of Faith and the menacing Sweeper, there will be a 4-storey tall water slide called The Hippo!